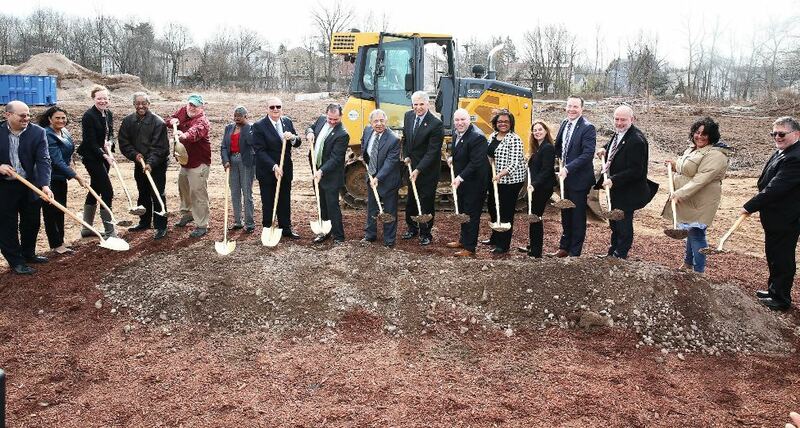 On March 15, 2019, the township of Bloomfield, New Jersey held a groundbreaking ceremony for the upcoming Lion Gate Municipal Complex project. The long-discussed $13.3 million project will repurpose, renew and reconnect (AKA the 3Re Strategy) the 18.2 acre site of the former Scientific Glass Factory. What will emerge will be a soccer field, a children’s park and walking paths along Third River. The project, which Mayor Michael Venezia’s administration has been working to adopt for over three years, also includes restoring historic and ecologically important wetlands that will reduce the impact of floods in the area, and the soccer field will feature an underground water draining system. “We are very excited to break ground on this exciting project that will have tremendous public benefits, like providing much-needed open space and lowering flood insurance rates for nearby residents and businesses,” said Mayor Venezia. “By taking an underutilized parcel of land and turning it into beautiful park and waterfront space to be enjoyed by the public, we are fulfilling our commitment to preserving and enhancing open space. We would not have accomplished this without the efforts of Councilman Nick Joanow, who has advocated for this park for many years, Township Administrator Matthew Watkins, our excellent contractors and environmental experts, and I would like to thank them all. I also want to thank the Department of Environmental Protection and Freshwater Wetlands Mitigation Council for their important grant assistance to help us jump start this complex which will enrich the lives of Bloomfield residents for decades to come,” he added. The creation of this Complex will be one of the largest infrastructure projects in Bloomfield in decades, costing approximately $13.3 million. That figure includes a $1.7 million Freshwater Wetlands Mitigation Council grant and a $3 million New Jersey Department of Environmental Protection grant. Funding also came from Green Acres and the Passaic River Natural Resources Restoration grants. Guests at the groundbreaking ceremony included officials from the New Jersey Department of Environmental Protection and the county, state plus local elected officials. Also at the event were State Senators Ron Rice and Teresa Ruiz, Assemblyman Ralph Caputo, Essex County Freeholder and former Bloomfield Councilman Carlos Pomares, and the entire Bloomfield Council. Photo courtesy Township of Bloomfield.